this was one of my favorite chapters, because it is full of so much truth that can help shape how you view marriage as a single person in today's world. most of the time in our culture and even in our churches there is so much emphasis put on marriage, finding "the one", etc. and not enough emphasis put on Christ and our relationship with Him first. growing up in the church throughout high school & college, i was asked "so are you dating anyone?" more than i was asked "so how is your walk with the Lord?" and while the questions were probably meant well or just to make small talk, it can easily turn marriage into an idol. it can easily become the focus of your life and maybe even become where you look for your worth. when marriage becomes an idol, it will not only make you feel unfulfilled in singleness, but you will feel increasingly unfulfilled if you do get married, because it cannot meet the expectations that you've built up. 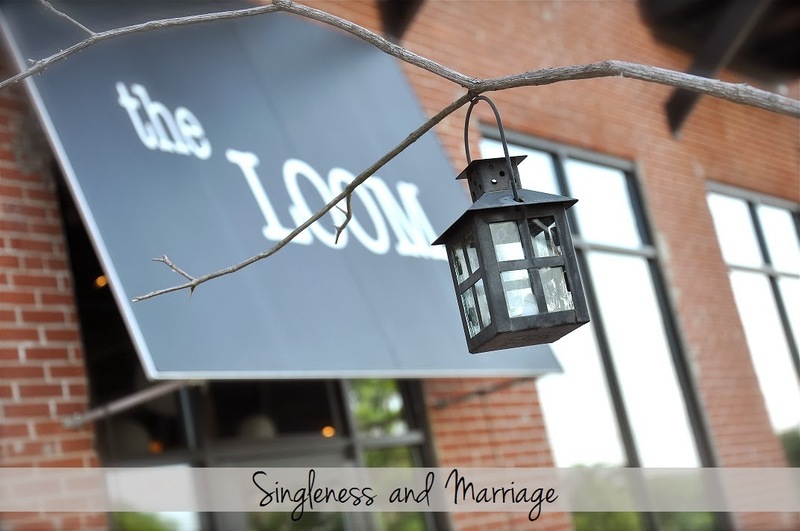 our culture tends to make singleness look like a less than ideal condition. but the fact that we are complete in Christ frees us up from thinking that marriage is the only way we will feel worthy and be fulfilled. when we look at marriage to be what completes us and what makes us worthy, we turn it into something that it was never created to be. however, when we know that we are complete in Christ first, we take that pressure off of marriage and can experience it the way that it was meant to be experienced - as a reflection of our love relationship with the Lord. when we stop expecting marriage to fulfill us, make us happy, etc. we are freed up to view marriage as two spouses working together to help each other become their glorious future selves. we are freed up to see that marriage teaches us about our sin in deeper ways and rescues us from them through a person who speaks the truth in love. and while marriage is such a good teacher of the relationship of Christ and the church, God also works in singleness. neither is an inferior state. if you get married, God is good. if you never get married, God is good. and it's very hard yet pretty incredible to come to that state of mind in the midst of our culture. marriage is not the end game, Christ is. As a single gal, I struggled with thinking that marriage would fulfill me and satisfy my heart's desires. I think it's a common misconception, even amongst Christians. How reassuring that when marriage, as great as it is, doesn't totally fulfill us, we can turn to the Lord who never fails to satisfy! I really love this, Robyn. It's so beautiful and so true. I know so many people who made marriage an idol, and I think it affects how we view ourselves and the priority we give Christ in our lives. i did too & in our culture i think most women do! i was lucky in that i was exposed to a lot books like this one before i started dating Thomas, but even so it is still such a struggle to view marriage correctly because it is talked about like it's the end game in our world. thank you Amanda! it is such a struggle for so many women (and men) in today's culture & that's why this is one of my favorite chapters! anything can become an idol, but i think marriage is one of those things that can be an idol in disguise! Christ should always be first! I think being single is great and being married is great. God can use you where you are at. I also truly believe that if you aren't happy and walking with Christ when you are single you won't do that when you are married either. Marriage isn't a 'happy' guarantee. It's great and I love being married but it sure has refined me in many ways. i so agree! marriage doesn't magically make things better & actually makes some things harder - like having less time to devote to things & your walk with the Lord! so you have to be more intentional! it definitely is a refining process :) thank YOU for sharing!